Some users, such as young students, struggle with traditional username/password authentication, resulting in lost class time while students and teachers deal with login issues. To help address this challenge, Identity Automation has developed a QR Code based authentication method. With RapidIdentity 4.1, teachers or administrators can be delegated the rights to print QR Code badges for students. Badge print sizes can easily be customized to accommodate various card stocks and templates, which can then be printed and distributed. Authenticating with these badges is a simple process that starts with the student clicking a “Scan QR Code” button on the RapidIdentity 4.1 login page. This activates the student's computer camera. Holding the badge to the camera authenticates the student with his or her username and password. 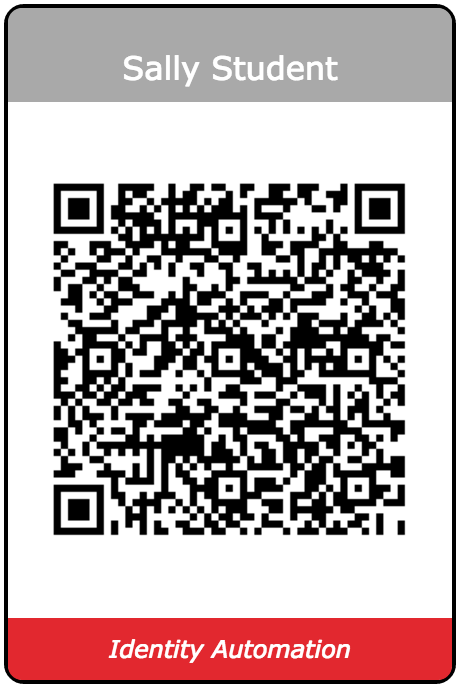 The QR Code used by RapidIdentity 4.1 is encrypted, so as not to expose the password. 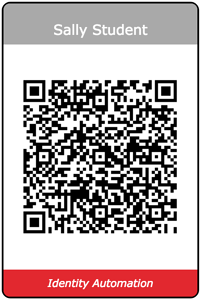 Additionally, QR Codes can be invalidated by simply changing a user’s password. RapidIdentity 4.1 includes an additional authentication method that uses pictures rather than traditional passwords. 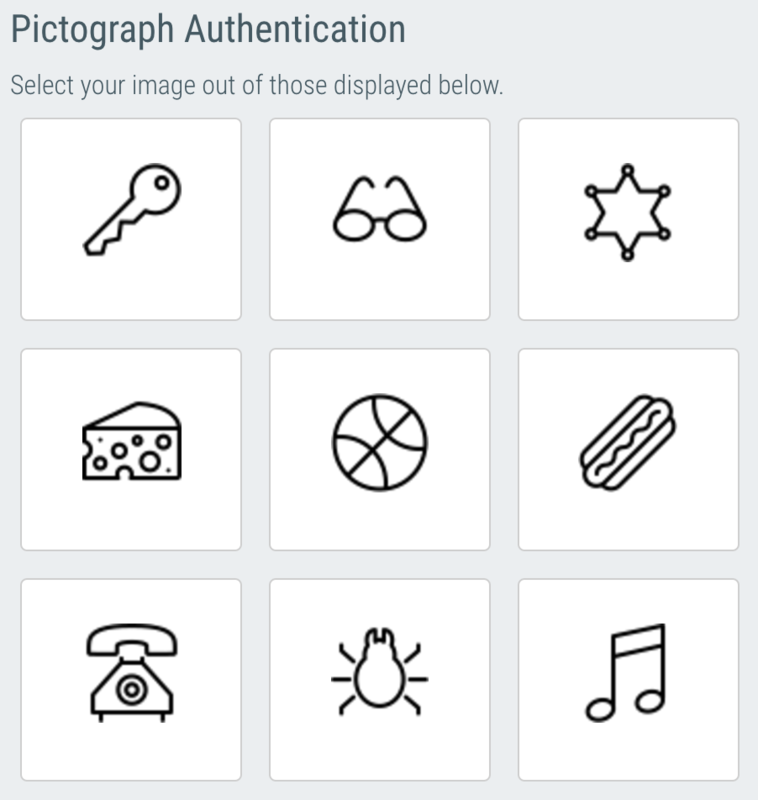 Out of the box, RapidIdentity 4.1 offers 30+ pictograph images that display in a random order. 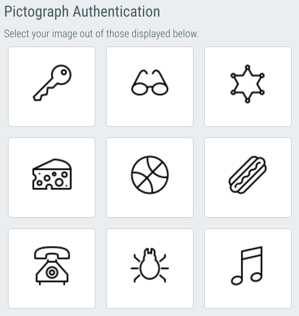 By default, a Pictograph password is comprised of 3 images. A user is shown nine images at a time, selecting one image at a time, until they have selected the 3 images that make up their password. Administrators can easily customize the images used, the number of pictures shown at one time, and the number of images required to compose a password. An excellent use case for Pictograph Authentication is to combine it with QR Code Authentication, effectively providing two-factor authentication (something you have and something you know) in a way that is intuitive for even the youngest of users. Easy application access is the primary need for the majority of users. In fact, we have customers with nearly 1,000 configured applications and 600,000 application launches per day. 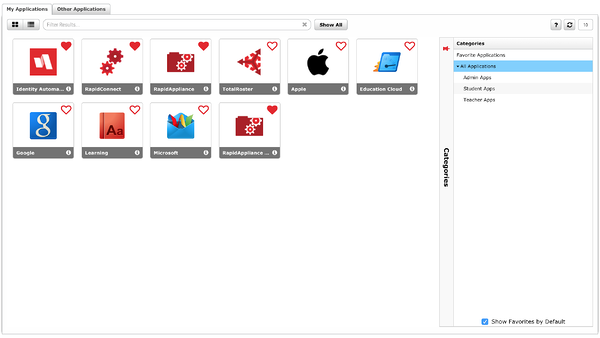 Now, with Application Categorization, you can organize applications by categories, giving you the ability to quickly view only the apps in a particular category. This is great for admins with hundreds of applications, for example, who want to only view applications relevant to a particular school or class. We’ve also given users something to love. Users can favorite applications by clicking the heart icon, and selecting “Show Favorites by Default.” This puts applications that are used most frequently ready-at-hand. We’ve added some enhancements to the Reporting module in RapidIdentity 4.1 that make it easier to create reports with specific date ranges. Traditionally, to run a report showing all failed authentication attempts for a specific day, you would have to open the report, edit the date range, and then execute the report. With RapidIdentity 4.1 you can now create reports to look at specific date ranges. Any report can be configured to always show the results for today, yesterday, the last 7 days, etc. RapidIdentity 4.1 also supports the ability to configure reporting parameters that can be specified when a report is executed. If you want to run a report against a specific user, group, or other parameters, RapidIdentity will ask for those parameters when you execute the report, instead of requiring the report to be edited, saved, and then run. Microsoft SQL Support: RapidIdentity 4.1 now supports Microsoft SQL 2012 and newer for the back-end database. Module Visibility Controls: Show or hide RapidIdentity modules based on Roles, Groups, or LDAP Query. RapidConnect RESTPoints: Expose RapidConnect ActionSets via RESTful web services to simplify integration with custom web UIs and other data push/pull services. To learn more about any of these features or product enhancements, please contact us or schedule a demo today.